Education is anything but education in the South American nation of Perú. For the most part, teachers are totally unqualified. They lack genuine academic credentials, and are employed more for being a part of a crony network of incompetence than for having a solid education or being subject-matter experts. Most receive their appointments as a part of ensuring the continuance of a political party motivated by graft than by any care for the learning process and the advancement of knowledge among the young. 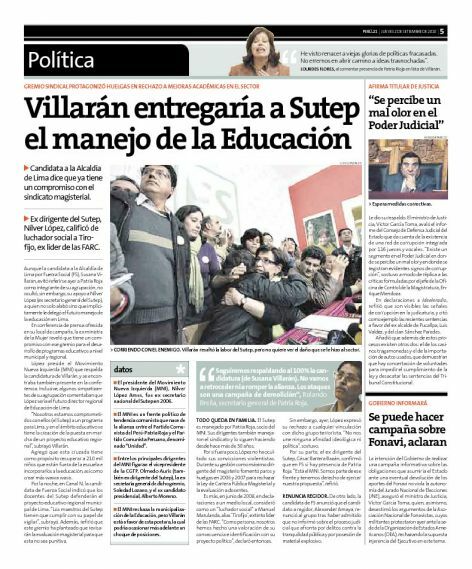 The disheartening reality is that the “teachers” know that they hold teaching positions without merit, that they are incompetent, but that they are protected by undeniably the most corrupt union of all: SUTEP (the acronym for Sindicato Unitario de Trabajadores en la Educación del Perú), founded in the 1970s, has a stranglehold on education and Perú politics. 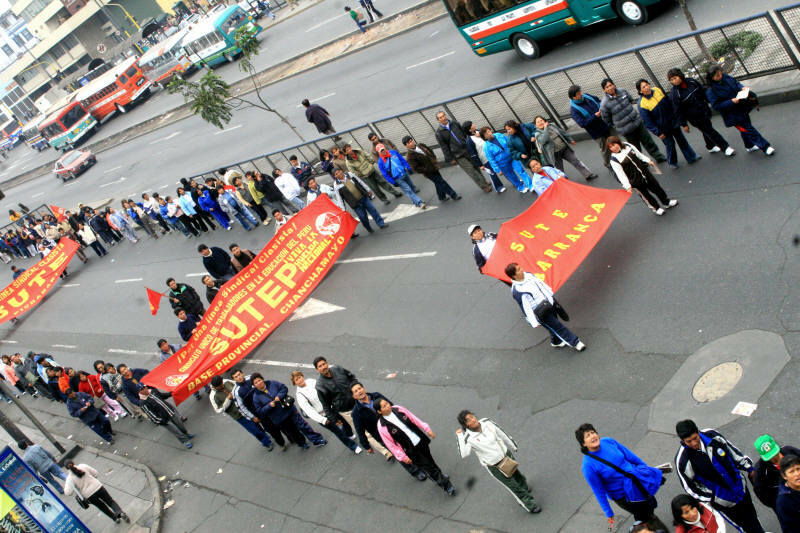 Teachers from all over Peru have taken part in Peru’s Teacher’s Union (SUTEP) strikes that are a regular occurrence. 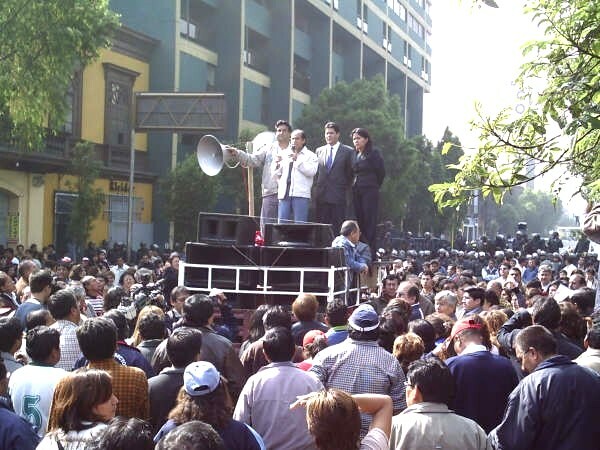 There have been acts of violence, people detained and property destroyed, while illiterate teachers march in demonstration against any efforts by a venal government to enforce academic standards or to demand quality in teaching–all due to teacher’s opposition to any education reforms that have been introduced or even hinted at over the past twenty years and have been or are being reviewed and close to being approved by Perú’s congress in Lima. The “teachers” protest that they were not consulted by the government on proposed amendments, that their “right” to teach was being tarnished by being required to take tests to prove competence in their subject fields, and their rights violated if they are dismissed for failing the basic test required by the government–with a minimum passing score being far lower than a failure grade in any First World Nation. (See: http://www.livinginperu.com/news/4204) In Junin, Perú, in July 2007, teachers, members of SUTEP, took hold of the building which belongs to the Regional Education Directorate and held it in a manner of any terrorist group plaguing South America. All principles of democracy, including a respect for the law and those enforcing the law, are shunned by SUTEP and the gangsters that control it. In Tumbes, again Police tried to control masses of protestors with tear gas but the only result achieved was to get banks and restaurants to close their establishments. Some children had to be taken to hospitals due to the amount of gas in the air. 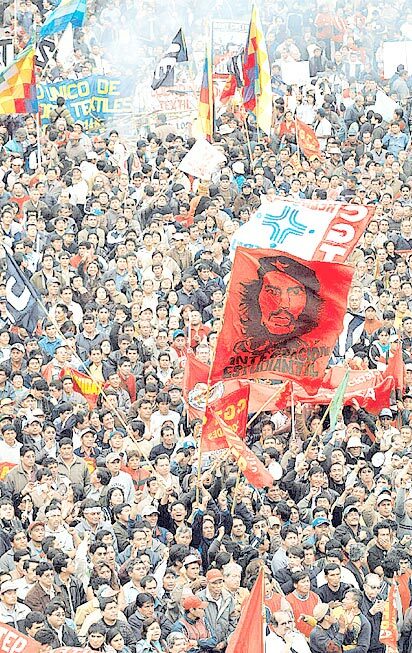 In Huaraz, Cerro de Pasco and Puno, Perú, over 12,000 protesters took over plazas and food courts and like common thieves helped themselves to the food that vendors were preparing to sell. SUTEP General Secretary, Luis Muñoz, stated that union leaders would not be held responsible for the violence that a radical group of SUTEP members – led by Robert Huaynalaya – took part in, and disavowed that the rogue element in SUTEP were common delinquents–breaking windows, demanding extortion, and injuring children. teachers were asked about the more than one-half of one million students being neglected most responded that the teachers first right was to be guaranteed a job that paid a salary regardless if the students learned anything. 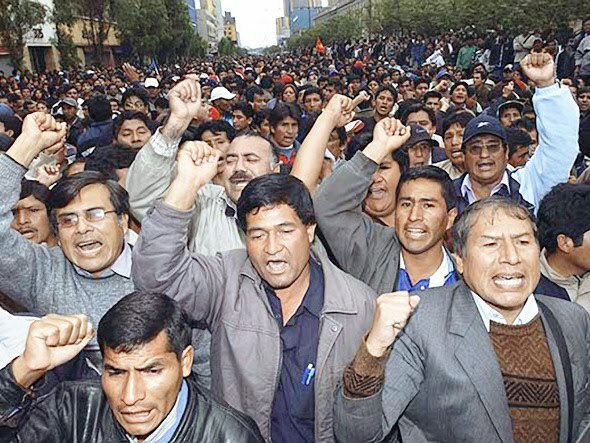 (See: http://www.livinginperu.com/news/4048 and http://www.livinginperu.com/news-4197-education-peru-perus-teachers-union-begins-strike-against-education-reform). 100 teachers including most of the Union’s national leadership (who claimed to be teachers but had not been active in a classroom for years) on July 12, 2007, and the dean of the Peruvian Teachers College (CPP) the evening of July 13, 2007. The greatest problem facing Chang and Garcia in 2007 was that the teachers neither could nor would teach as few had any subject matter knowledge. Today, in 2010, I have students in my classrooms in Perú who are taking English 2 and 3, and claim to have studied the English language for up to three years or more at public schools and cannot pronounce an English word correctly, use it in a sentence, and cannot spell it. What is so distressing is that most of their teachers are totally ignorant of English and merely read the textbook(s) to their students. Neither teachers nor students, in these situations, know what is written, how to interpret it, and have marginal skills in translation. Most students still listen to English, if it is slowly spoken, and attempt for a rapid translation of the words spoken in English into native Spanish before even attempting to respond. Some students even have threatened me with bodily injury if they did not get a 20 (a superior grade) at the end of the “cycle”–and openly admit to having earned no more than a grade of 4 or 5 (failure) on all exams, turned in no homework, do not participate in group discussions, and have little interest in the language. Several are taking the course so that they can become “teachers of English” which is seen as an easy job with no work required. As for scholarship and ethics in research, both are foreign to my students. I have repeatedly sent plagiarized papers (literally lifted from Wikipedia and other websites) that were taken fully from the source–including footnotes and bibliographies. When I failed the students for this plagiarism, they laughed–and handed me additional papers that were “scissors and paste” productions. This is not unique, for even professors “publish” this way–as I have discovered occurs even in the “better” universities where “teachers” take entire books and put their names on the reprints as if they were the authors. While Perú has a copyright law, Perú does next to nothing to stop illegal copying of books, records, DVDs, CDs, and so forth. It is easy to find even unreleased Hollywood films on the streets selling for S/.3 to S/.5 (about $1 to $1.50), and books for $2–although the cinemas are graining and most copied books are missing pages and even full chapters. Education in Perú will never get better until qualified teachers are found, hired, paid a just wage, and materials are offered to the students at a reasonable cost–not inflated 100% as is the rule for most schools using books published by UK presses. Libraries must be expanded, reading made mandatory, writing skills taught and coached, and grades recorded based on merit having been earned by the student. This will be difficult as many schools spend more time preparing for festivals and parties (or in the case of religious schools, the religious leaders granting permission to any student to attend the place of worship if “the desire is strong” even if it means allowing the student to miss a class or an examination; the worse offenders are, of course, institutions that are either run by or connected with Opus Dei) than working to ensure learning.